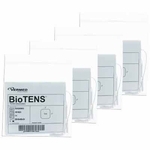 Important: These Gel Pads are intended for use with the Fuego TENS Unit only. 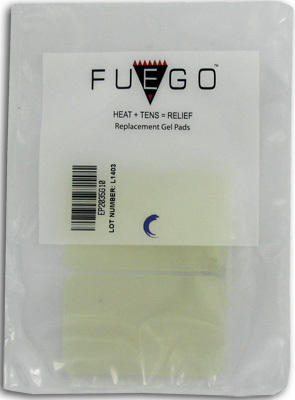 Fuego TENS Unit Electrode Gel Pad 2x3.5"
IMPORTANT - These Electrode gel pads are for the Fuego Heated TENS Unit only! 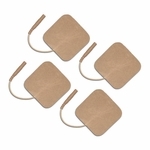 Now combine heat and nerve stimulation directly to pain areas. 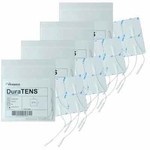 Heat from 96 to 108 degrees F.
Improved Technology : The new Fuego TENS Unit combines the pain relieving technology of TENS with soothing healing heat. 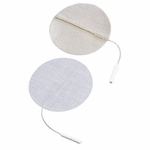 New heating electrodes concentrate a penetrating warmth where you need it most, directly on your treatment area. This unit is ideal for upper back, lower back, neck, arms, legs, or just about anywhere you are experiencing pain and discomfort. Digital control over 9 treatment modes, temperature and treatment time, gives you full control over each therapeutic session. 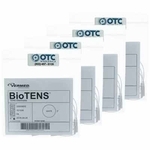 This FDA Approved TENS Unit is both Safe and Effective. 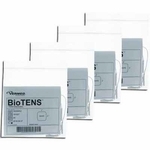 The new Fuego TENS Unit overrides the pain signal to the brain. By sending a comfortable electronic impulse. When the new Fuego TENS Unit overrides the pain signal, it "tricks" the brain into thinking there is NO PAIN. 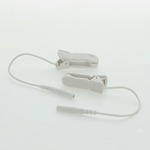 This produces Fast and Rapid Pain Relief, usually within a minute or two. 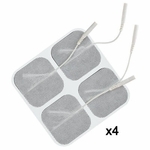 You can control and customize the intensity, pulse rate, and pulse width to "experiment" and find the best setting for your pain relief.